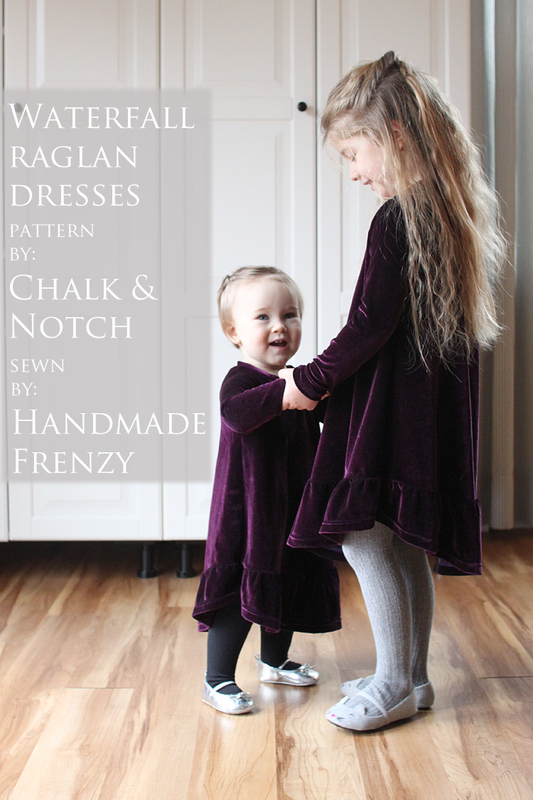 I fell in love with the Waterfall Raglan pattern by Chalk and Notch right from the start. I fell **Head.Over.Heels** with the stretch velvet versions popping up everywhere. 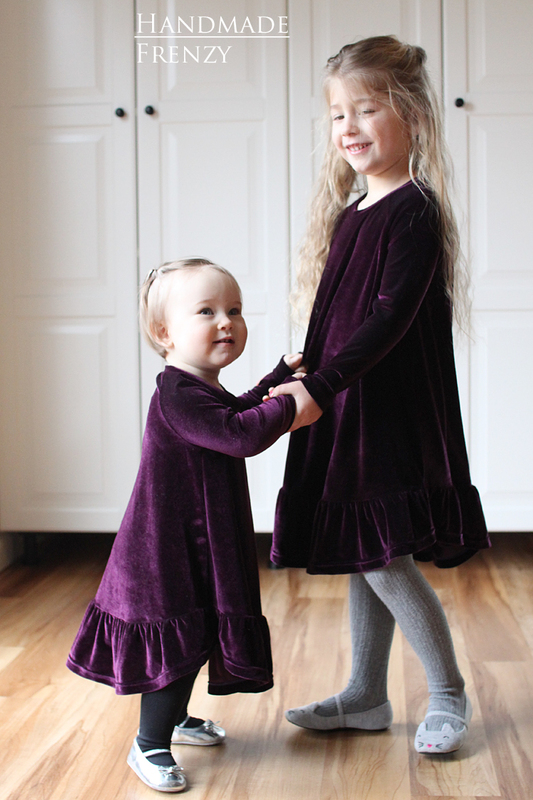 Since I don't have 2 girls of my own to sew matching things for, I took advantage of the opportunity to sew matching cousin dresses instead! Oh my goodness, I just about can't handle the cute!! 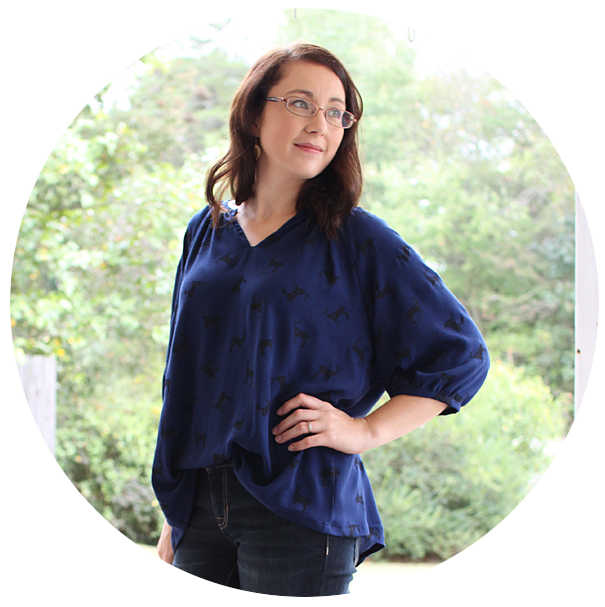 The Waterfall Raglan is another fantastic pattern from Gabriela. 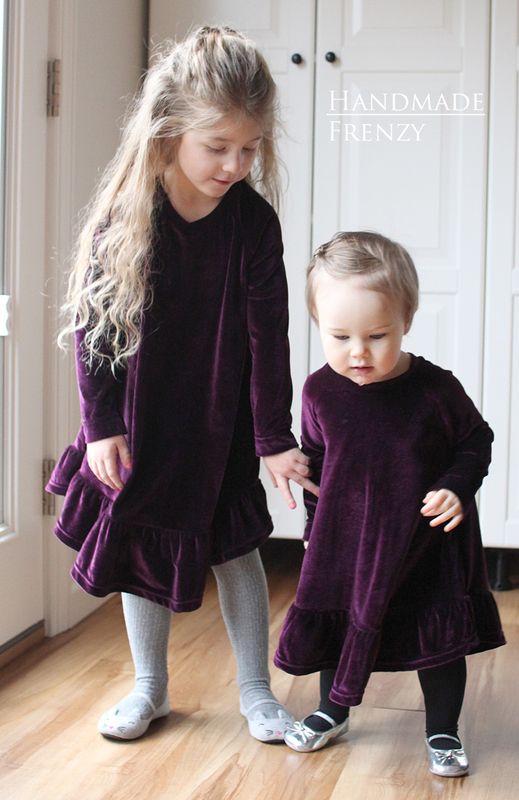 It has a gathered ruffle hem, 3 sleeve options (short, 3/4, long), and top or dress length. For my 12 month old niece (who wears 18-24mo RTW), I made the pattern size 12-18 month. The fit of both dresses is spot on. O's dress is a size 4 with size 5 length based on her measurements. The fit is perfection. I just really love the easy comfortable design of this pattern. 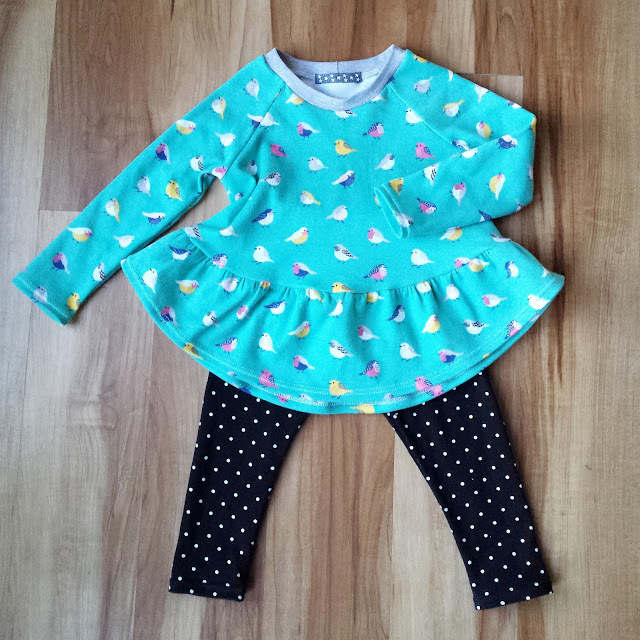 That ruffle hem gives it just the right amount of special, and because it can be sewn in such a huge variety of knits and prints it is extremely versatile! Not to mention all the options, it's perfect for every season and every occasion. 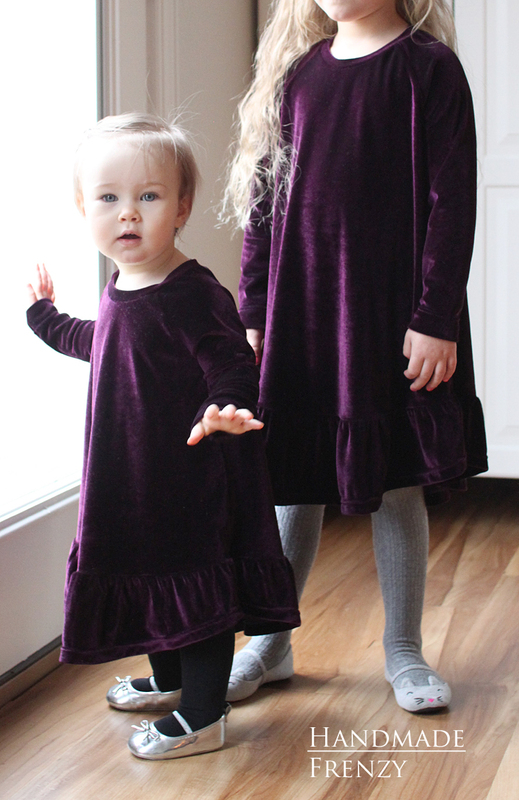 The fabric I used for the dresses is Eggplant Stretch Velvet from Stylish Fabrics. This was my first time sewing with this type of fabric and it was a great experience! I struggled a little bit getting my fabric lined up for cutting until I discovered if folded right sides together, the nap "grabs" against itself and stays put! From there it was easy going. 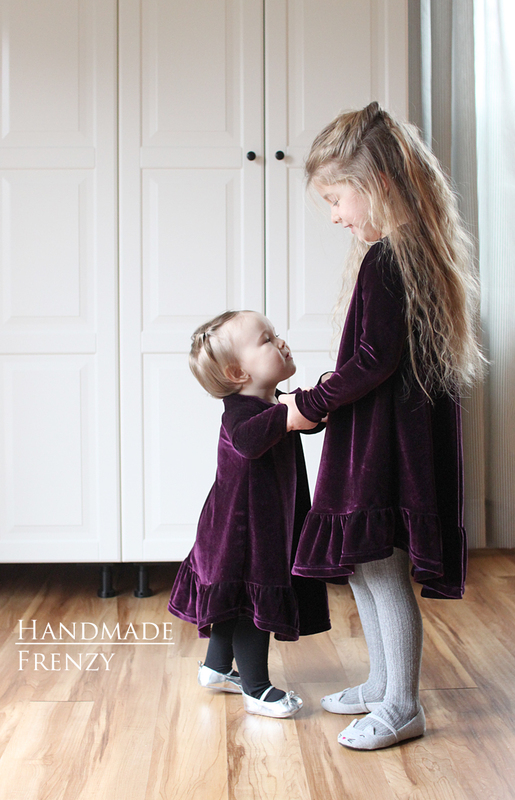 Here is a fabulous post on sewing with velvet that I would recommend reading. It is a little bit delicate, especially if using an iron. But as far as washing, I prewashed in cold water and tumble dried. Since sewing, I machine wash the dress in cold water and air dry flat. Just to preserve the life of the fabric. Don't shy away from this substrate! It is absolutely lovely. 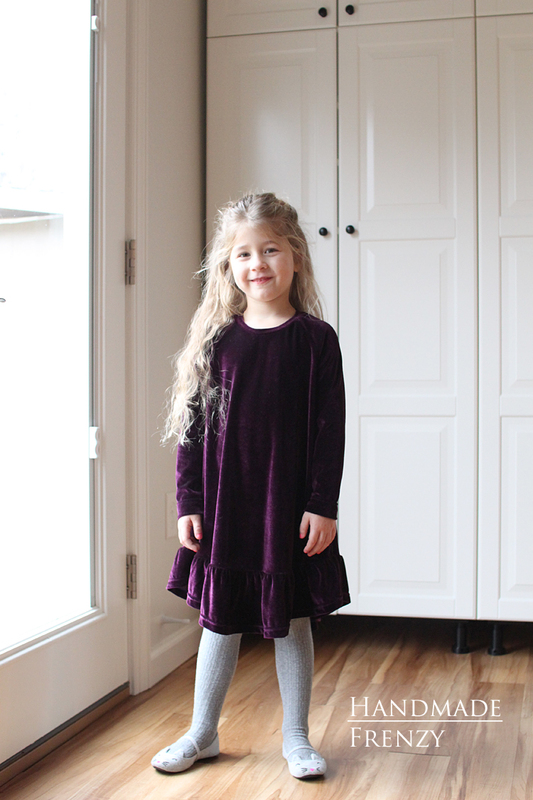 Just because the glitz of the holidays is over, doesn't mean this dress is getting stashed away. It's perfect for winter Sundays! However, I can't wait to sew a bunch more of these, especially tops, to wear with leggings and jeans!